(New York) - Thai security forces should immediately stop forcing Karen refugees and asylum seekers to return to Burma from refugee camps in Thailand, Human Rights Watch said today. The Karen, an ethnic group who have fled armed conflict and human rights violations in Burma, face persecution and violent reprisals by the Burmese military government if forced to return, Human Rights Watch said. On July 17, local Thai paramilitary forces, the tahaan prahn (literally “hunter-killer soldiers”) rounded up 52 Karen from two refugee camps in Thailand’s Mae Hong Son province along the Burma border, 39 – mostly women and children – from Mae Ra Ma Luang refugee camp and 13 from Mae La Oon camp. They permitted 17 students to stay on the Thai side, but sent 35 refugees across the border to the Ei Tu Hta relocation site in Burma. The refugees, part of a larger group of more than 280 who fled to the Thai camps in early 2008 during a major military offensive in Eastern Burma, were told late on July 16 that they would be forced back the following day. According to local refugee sources, tahaan prahn commanders announced that all new arrivals since April will eventually be forced back to Burma. Although Thailand has not signed the 1951 Refugee Convention, it is bound by the principle of non-refoulement, a firm prohibition in customary international law on returning refugees to any country where they are likely to be persecuted or their lives are at risk. Human Rights Watch called on the United Nations High Commissioner for Refugees (UNHCR), the European Union, the United States, and other states to pressure the Thai government to immediately cease the refoulement of refugees and continue to provide sanctuary to people fleeing fighting or persecution in Burma. Ei Tu Hta relocation site in Burma, located along the Salween River, has grown during the past two years to nearly 4,300 civilians who have fled attacks and abuses by the Burmese army. The overcrowded camp receives limited international and local health and food assistance, which is often blocked by local Thai security forces. In addition, the camp faces the constant risk of attack because of its proximity to Burmese army encampments. Thai security forces only permitted the 52 civilians sent to Ei Tu Hta camp on July 18 to carry two weeks’ supply of food and basic plastic sheeting, and prohibited the refugees from carrying mosquito nets or cooking utensils. More than 100 civilians arrive at Ei Tu Hta camp each month as the Burmese army continues its offensive in Northern Karen State despite the monsoon rains. Human Rights Watch believes that there are now more than 90 Burmese army battalions (more than 10,000 troops) operating in the area. The soldiers are forcing Karen civilians into relocation sites, or burning their villages and food stocks with the aim to clear the area. More than 50,000 civilians have fled or been displaced by the army offensive against civilians in Eastern Burma, which has been ongoing since 2006. 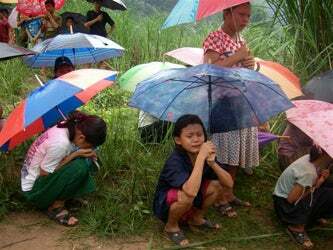 They join more than half a million internally displaced civilians in Eastern Burma. The offensive in Eastern Burma is the largest operation by the Burmese military in several years. It has been denounced by international groups, including the International Committee of the Red Cross (ICRC), in a June 2007 statement, and Amnesty International in a June 2008 report. Refugee protection in Thailand has sharply deteriorated during the past several years, as the Royal Thai Government’s procedures for registering refugees has been bogged down. There are an estimated 20,000 unregistered people out of 148,000 in the nine Karenni and Karen minority refugee camps along the border, many of whom would likely qualify as refugees. Without registration, most are not eligible for food and shelter, nor do they receive formal protection from the UNHCR. In March 2007, Thai security forces forcibly returned nearly 100 Rohingya Muslim men from Western Burma to an area controlled by a pro-SPDC armed group along the Thailand Burma border. For more than a year, Thai security forces and Ministry of Interior officials have been threatening unregistered refugee camp residents with forcible return. The hundreds who arrived at the two Karen camps of Mae Ra Ma Luang and Mae Ra Moe have been routinely threatened with return since May by local security forces, claiming to act on behalf of the central authorities in Bangkok.